The goal of Just Fillin’ by Playtoniq is simple: raise the water level to the top of the iPhone’s screen as quickly as possible. 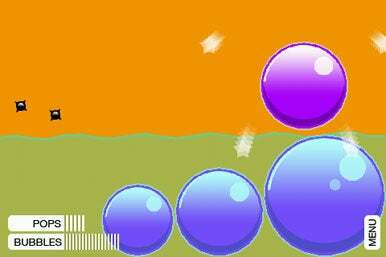 You do this by “fillin’” balloons, which then fall into the water, displacing the liquid and making the level rise. A Rising Tide: You make the water level rise in Just Fillin’ by pumping up balloons and dropping them into the water. But look out for those sharp spikeys. To fill the balloon, you press and hold on the screen. The longer you hold, the more the balloon inflates and the larger it becomes. However, there are sharp “spikeys” that hover around above the water—as you inflate the balloons, they’re transparent and vulnerable to popping by the spikeys. Take a long time to inflate a balloon, and you increase the risk of having your efforts go for naught. Once you finish inflating the balloon, it turns solid, and the spikeys simply bounce off of it. As you proceed through the game’s levels, the number of spikeys increase, making things more challenging. You can also twist and turn your iPhone or iPod touch to swish the water around or move the balloons, lining them up under the surface of the water. Playtoniq does a nice job of using bold colors and easy-to-understand controls to make this simple game enjoyable. A free version of Just Fillin’ features limited levels, while this $1 edition comes with unlimited levels and a Hard mode for a more challenging experience. Just Fillin’ is the type of game that you can show to a young kid or an adult looking to kill some idle time, and they’ll both have fun with it. Just Fillin’ is compatible with any iPhone or iPod touch running the iPhone 2.x software update.